CarGurus has 52,302 nationwide Elantra listings starting at $1,000. A whole new design inside and out as well as a focus on technology, efficiency, and safety have brought the Elantra to the front of the small-car pack. Every year, compact cars get better and better. As early as the mid-2000s, it occurred to some automakers that commuters desired features like heated leather seats, navigation, and keyless entry in smaller cars. A daily driver that's good on gas and easy to park shouldn’t also be deprived of basic creature comforts. And from that climate, Hyundai began its ascension into value-oriented vehicles that don’t feel cheap. The culmination of that quality-small-car campaign is the 2017 Hyundai Elantra. It builds on a very competent outgoing generation with some of the best styling, ergonomics, safety, and technology you can find for short money. The Elantra has come a long way since its humble beginnings in the 1990s, and while the hotly contested small-car market has come a long way since then, it's the Elantra that appears to have made the most progress. But is a tech-laden redesign enough to take on the likes of the Ford Focus, Toyota Corolla, and Honda Civic? 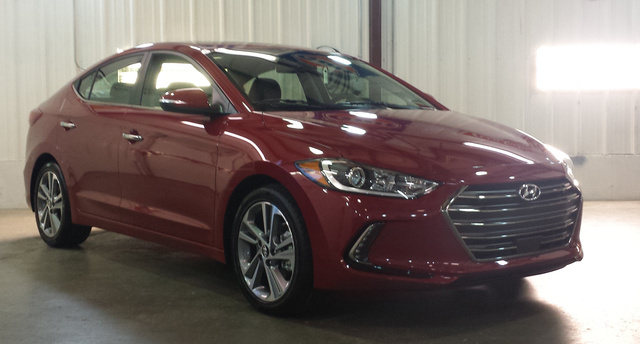 The first thing you'll notice is the sharp new exterior appearance of the Elantra. The outgoing model had a pretty sharp look, but its busy face often felt homogenous in the crowded small-car segment. Not so with the 2017, which has a massive grille and aggressive LED headlights. In fact, you can even see inspiration from the Elantra’s bigger brother, the Genesis luxury sedan, which itself takes cues from the Germans when it comes to styling. The similarities to the Genesis are more apparent out back in the taillight assemblies. We can expect more Hyundai models to share these design cues, making the Elantra something of a thought leader for the conservative-yet-well-defined styling that will be found across the Hyundai lineup for years to come. Inside the cabin is more Audi-inspired styling, but in a good way. The previous Elantra featured an eye-catching interior that was a bit cluttered, much like that of the Ford Focus. While the Focus continued to go for form over function, the Elantra’s interior offers both form and function, with emphasis on the latter. Its straightforward design returns audio and climate controls to very conventional layouts, which should make them easier to use. Hyundai makes the whole trim-package thing pretty straightforward for buyers. At the entry level, you have the SE trim, which has basics like power windows and locks, a 6-speaker stereo with AM/FM/XM radio and a CD player, and USB/auxiliary audio inputs for charging your phone and accessing its music library. Step up to the Limited trim for niceties such as standard Bluetooth hands-free phone connectivity with voice control, keyless entry, push-button start, and steering-wheel-mounted audio and cruise controls, all of which are also available as optional features on the SE. Located right next to the shifter is a Drive Mode selector button. This tweaks the engine/transmission mapping and the steering feel for Normal, Sport, and Eco drive modes. The EPA estimates fuel economy of the Elantra at 29 mpg city, 38 highway, 33 combined. Despite having the same drivetrain, fuel economy falls to 28 mpg city, 37 highway in the Limited. If you opt for the SE with the manual, fuel economy falls to 26/36. Acceleration is rather brisk considering the drivetrain makes less than 150 hp, but you can certainly tell how much the 2-liter is working by the mechanical whine every time you get on the throttle. It's a lot of engine noise in an otherwise quiet ride. An Eco trim will be available later this year, featuring a turbocharged 1.4-liter inline 4-cylinder making 128 hp and getting an estimated 35 mpg combined. With the drop in power and smaller displacement, expect the Eco trim to exhibit similar noise issues under acceleration. As for our Limited, it featured a really supple suspension that soaked up some serious potholes in New England spring roads full of heaves and holes. Despite its softness, the ride was never wallowy, and the Elantra's cornering still felt rather sprightly. As stated before, the straightforward layout of the interior is one of the Elantra’s strong suits. While many new cars go for the most radical interior, their designers sometimes forget this is where occupants must live for their commute every day, and often neglect basics such as thoughtful storage. 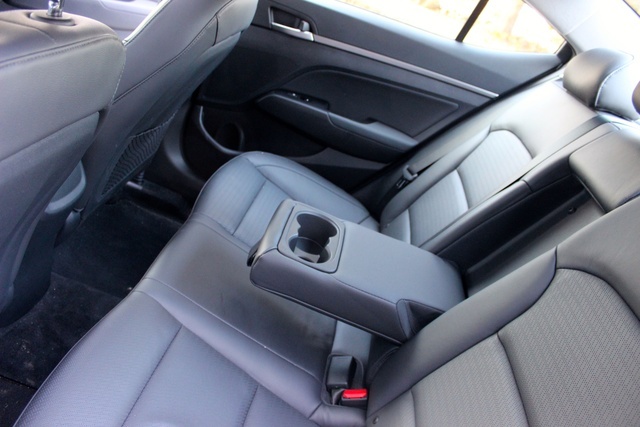 Not so in the Elantra, where a small compartment in front of the shifter reveals AC power ports, USB/auxiliary audio ports, and a place to put your wallet and phone — sometimes it’s the simple things. Our Limited’s large touchscreen sits atop a center stack with a very straightforward, traditional control layout. But with Hyundai’s Audi/BMW-inspired approach, “straightforward” also means “refined.” But unlike in German cars, the infotainment screen is an actual touchscreen and doesn’t rely on confusing proprietary controls like BMW's iDrive or Audi's MMI. This is just one more way the Elantra is just as useful as it is attractive. The driver gets a tremendous amount of legroom — even at 6-foot-3, I had to move the power adjustable driver’s seat forward several inches. This is likely at the expense of rear seat leg room, but as long as you are carpooling with 3 people or less, this shouldn't be a problem. 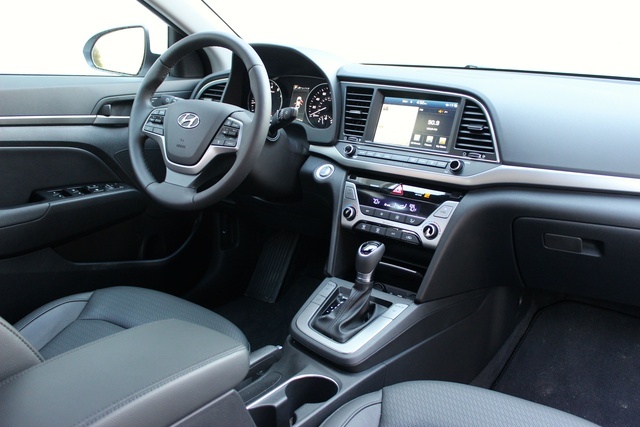 Every Elantra comes standard with USB/auxiliary audio inputs and SiriusXM satellite radio. Moving upmarket gets you the navigation system, which features turn-by-turn instructions in the color display in the gauge cluster. The voice-control system found in the Elantra is consistent with that of other higher-end models like the Genesis. This is a powerful voice-control system and can understand complex instructions, such as inputting a navigation address without having to go through several menus. 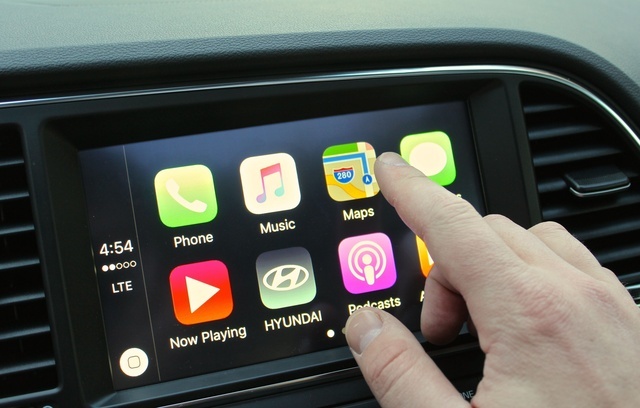 But the true cutting-edge infotainment tech comes in the form of Apple CarPlay and Android Auto. Plug in your iPhone or Android phone via the USB port, and you can use these custom operating systems to operate many of your phone’s features directly from the touchscreen. When receiving a text, the system will read it out to you, and (in the case of the iPhone), you can use Siri to send a reply via voice control. One other excellent piece of tech is the hands-free trunk system. If you have your hands full of groceries and need to open the trunk, simply make sure your key fob is in your pocket when approaching the rear of the vehicle, and you’ll hear three beeps before the trunk opens on its own. 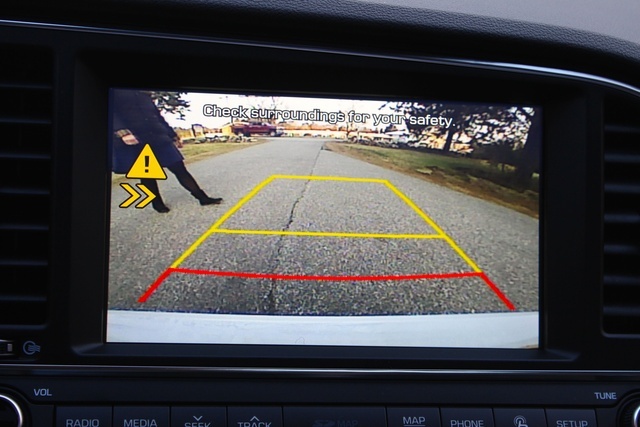 Hyundai touts all the safety tech you can get on the 2017 Elantra, and with good reason — many of these features were previously found only in higher-end cars and are now making their way into small cars like the Elantra. This includes electronic stability control, vehicle stability management, traction control, and a tire pressure monitoring system. Forward-collision warning with pedestrian detection, lane-departure warning, blind-spot monitoring, and a backup camera with rear cross-path detection are all available. Hyundai expects that the 2017 Elantra will earn an IIHS Top Safety Pick+ and a 5-star NHTSA crash-test rating when it's put through testing. The base SE trim for the 2017 Hyundai Elantra starts at $17,150, and the Limited starts at $22,250. The Limited also offers some additional packages, like the Tech Package, which adds navigation, an Infinity premium stereo, sunroof, heated rear seats, and an auto-dimming rear-view mirror, all for an additional $2,500. The Ultimate Package costs another $1,900 and adds headlights that bend with the road, smart cruise control, the aforementioned lane-departure warning, and collision avoidance. A fully loaded Limited will top out at around $27,000. That puts it well under the pricing for the equally impressive albeit larger Honda Civic and about the same price as the Toyota Corolla. 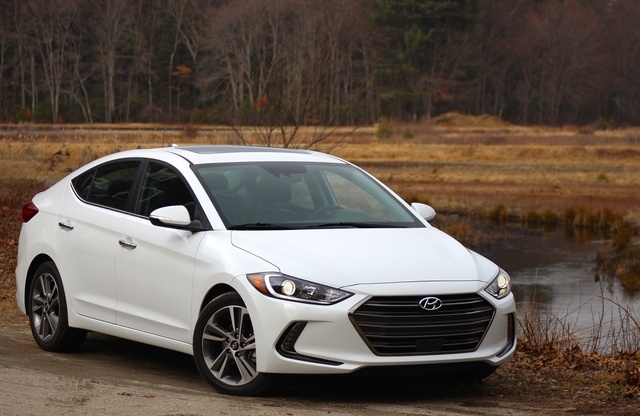 But the Elantra is a much more impressive vehicle than the Corolla, and while the Civic is larger and just as loaded with features, it will cost nearly $30,000. This places the Elantra firmly among the pack leaders when it comes to small cars, and the Elantra now features cutting-edge safety and technology equipment — making it a better car than the Corolla and a more affordable car than the Civic. 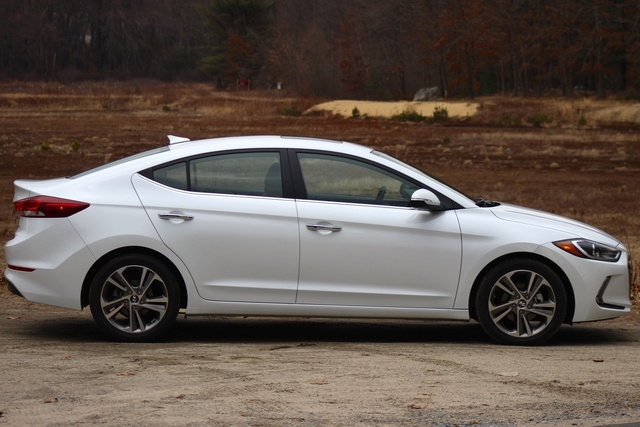 In short, it's arguable that the Limited Elantra is the best small car for the money. What's your take on the 2017 Hyundai Elantra? gbm1 Tight handling, decent steering, quiet cabin and enough get up and go to satisfy all but the race car drivers. Back seat takes the bumps better than the Mazda 3. Nicely equipped with both optional packages on the Limited. Better Navi display and back up camera than the Mazda. Niomi Mine makes a rattling sound in the engine. Faint but i can hear it....usually only when accelerating. Other than that im happy with the car. Just hope the rattling is nothing as thr dealership says. Stantheman99 What's with the hesitation?? It is not all the time but I Drive for Uber with my new 2017 Elantra and it seems when I have been driving a lot, sometimes I can push the gas pedal and NOTHING HAPPENS! If I take my foot off the gas pedal and "feather" it, most times it will catch after a few seconds. It is really dangerous to have this issue especially with Uber passengers in my car. I go to make a left turn with plenty of time before the oncoming car will arrive but I end up being "stuck"in the middle of the intersection waiting for the gas pedal to connect and give me power to make the turn. It is scary to me and my passengers as they think I am a bad driver not to mention the people in the oncoming car and the car behind me that is expecting me to move through the turn in a normal way. I have read many persons who have reported this in older Hyundais but apparently, it continues to exist in the new cars as well! Any thoughts?? Bill My 2017 VE sounds like a diesel engine until it reaches full operating temperature. Dealer tells me this is normal, but I can't imagine that they designed it this way. The acceleration is very unpredictable. Some situations it seems accelerates well and others it hesitates, usually when you most need it to go quickly. This occurs no matter which mode it is in. The ride is nice, but you pay for it in the way it handles. It's very twitchy on the road and I have to pay attention to how fast and where I'm going for fear of losing control. My biggest problem with this car is that the front 10 way adjustable seat is the most uncomfortable seat I've ever sat in. It's too deep, too narrow, and way too hard. There is a steep angle built into the bottom cushion from the front to back so you can't adjust it to a flat position. This makes it impossible to adjust the relationship between the bottom and back to 180 degrees or more, which is what is recommended by my physical therapist as well as most doctors and chiropractors. After about half an hour in this seat my bottom hurts and by an hour my right hip hurts and I have sciatica pain down the right leg. More than an hour and I have to get out and walk around. Very disappointed in this car. Landon What kind of MPG does the 2018 (or recent) Hyundai Elantra Sport get with that better 201 HP? Users ranked 2017 Hyundai Elantra against other cars which they drove/owned. Each ranking was based on 9 categories. Here is the summary of top rankings. Have you driven a 2017 Hyundai Elantra? 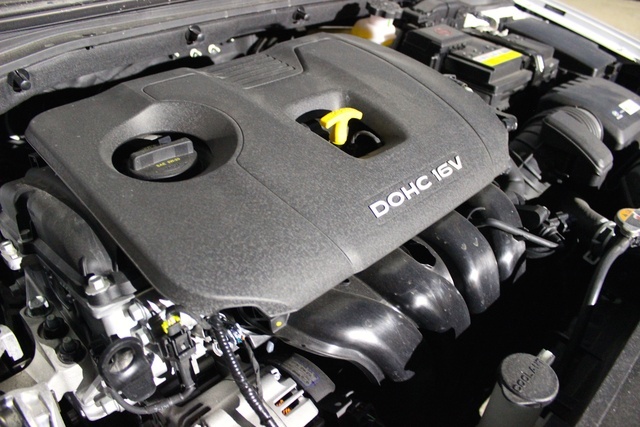 What is oil change frequency? Ignition Coil Problem Or Something Else? I Can't Start My Elantra 2017. How Do I Keep Radio Playing In A 2017 Hyundia Elantra Limited? How do I keep radio playing in a 2017 Hyundia Elantra Limited when I turn the engine off?